Q:Can this gate be opened/closed from both ends? Q:Would it be possible to put two of these gates together, stacked one above the other to make it taller? I believe you would definitly get a good sag in the middle when extended !!! Jim Q.
Q:is it easy to open for an adult once it’s hooked up? Q:How wide is the 84 gate when not in use? It is a total of 22″, including the end piece. Q:Can this gate stand up to outdoor weather? Want to use it on a deck to keep cats in, but worry about rain, heat effects. I painted mine for weather resistance. Q:I need to expand the gate about 3″ more than the 36. Is this possible? This gate expands to 108 inches. You should look for a shorter gate if you only need ~40 inches. Q:please list all tools needed for insallation. Q:Is the “foot” permanantly fixed in the center, or can it be moved to one side or the other, of the gate? The foot is permanantly fixed in the center, works great! Q:WHAT IS THE SIZE WHEN NOT IN USE ? Q:Is this gate study enough if a child accidentally leans on it? My opening is actually 85″ will this fit also? The gate will open up to 108″, so it will fit your 85″ opening. I don’t think that the gate is sturdy enough for an animal to jump on it or for a child to push or lean on it. Q:Can this gate be used outside on a deck? I actually use my gate outside and it’s fine. Q:From reading through the Q & A I understand that the gate not only opens and closes like an accordion but also pivots on the brackets. Correct? Q:Years ago, I had an expandable circular version. I just ordered 2-108″ gates. Hope I can connect tandem & circle them as well? i really don’t know if you can maybe a oval but not a circle. you can try . 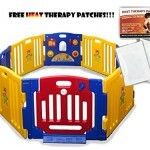 go to http://www.amazon.com/Summer-Infant-Secure-Surround-Play/dp/B000G1YW98/ref=sr_1_fkmr0_3?ie=UTF8&qid=1410115421&sr=8-3-fkmr0&keywords=out+side+round+Accordion+Style+Wooden+Pet+Gates that’s the best i can do. Q:I want to install the 36″ gate. How much does it stick out from where it is mounted? About 11″ when folded in. Q:I have crown molding along the floor of my house. Can this gate be installed with the crown molding? There are two mounting points on each end of the gate. A spacer the same thickness as the molding would need to be installed on the upper mounting point equal to the thickness of the molding to keep the end of the gate plumb. Or if you can mount it just above the molding square on the wall is another option. Anything can be done. where there is a will there is a way. Q:The space I need to gate is 83.5 inches. Would I be better buying the 84 inch gate or the 108 inch gate? Q:When not in use, can this be pushed to one side ? I saw something about a permanent “foot” ??? Q:How tall is the 108″ gate? Q:Can it be used outside to keep a pet on the deck? Wondering how the wood does with the weather? Q:I need to put this gate at the top of deck stairs. Is it: 1) durable enough to use outside and 2) durable enough to contain 1 year old? I use mine indoors to keep pets and children out of the living room. Being wood, outside use is questionable but should work, just figure on a short life span due to environment. I would never use it as the sole safety gate at the top of a flight of stairs for a child. The gate is convenient with it’s accordion opening, and swing away features, but it won’t substitute for a steel safety gate. Q:I didn’t read anything in the description what the gate is made of. It is wood, plastic? Q:Will the 84″ gate stretch to fit an 86″ space? No, and the instructions warn against attempting to overstretch the gate beyond the intended length. Q:Could I install the 36″ gate in a 41″ opening? The 108″ gate I bought cover an 112′ opening. It could stretch a bit more. I would guess it could stretch 8-10″ more, but that would be it. Based on that, you would only need 5″, so you’ll need to decide. My gate is heavy so it would be costly to send it back had it not worked. Amazon only pays for return shipping if the product is faulty. Hope that helps. Q:Does this gate have to be attached to a door frame or can it attach to a wall? Q:Does anyone know the approximate size of the openings in the gate? I have a Lab puppy, and wonder if her head can get stuck in the openings. Your pup should be fine, the openings are pretty small, I don’t think our chihuahuas or cats could put their head in an opening. Q:Does this gate open? Swing to open or collapse to open? You can unmatched and swing open or compress in to shorten width. Q:Has anyone had any experience with your small dog trying to “lift” the gate from underneath? How far is the bottom from the floor? Thank you! I have large dogs, but dogs can try to lift the gate. To mitigate that issue. I mounted the gate just barely above the floor with about a quarter to half an inch clearance. I hope this advice helps! Q:Would this hold well against 70lb and 50lb dogs? We have a 72″ opening and our dogs will probably try to tip it over or jump over it. I would say no. Although it is pretty strong. 70 lb dog trying to jump over it will probably collapse it. Q:i would like to use this to block off my entertainment center and would like to know if this gate will be able to go around things. is it flexible? Q:About the 60″, can I fold it to fix in my baggage? Maybe just the end.. I guess that would depend on the size of your bag. The collapsed dimensions are 33 x 25.5 x 1 inches, so it might be tight. I would measure the inside dimensions of your luggage first. If you’re taking it someplace, why not just have it shipped there instead of your house? Q:Will the gate make a 180 degree turn? Q:How high is this gate ? It is 32 inches high. Perfect for my min pins, keeping them safe. So So easy to instal.. I recommend this safety gate and would buy iy again. 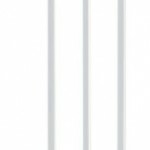 Q:When fully retracted (not expanded), how wide is the 60″ gate from the mount to the end? Hey Christian….when fully retracted (closed so to speak) it is only 23″ wide and that includes the piece of wood that attaches to the gate itself and also the wall. Hope this helps! Q:How wide is the !08″ gate fully closed? Per the dimensions stated in the product specifications the 108 gate fully closed would be 25 1/2 Inches So with hardware it would be about 27 inches..
Q:what is the height (FROM THE GROUND) of the left and right “end slats”, which get screwed to the wall (for swinging and latching)? Which size gate are you looking for? I have the smallest one mounted. Are you looking for the height to the bottom hardware or the top? Top bracket on the small gate is 32 1/2″ (swinging side) from the carpet, but mine is about 1/8″ too high. (would not fit in the floor bracket, but we have carpet so did not install that) the top latching screw is at 31″. Q:Have people had problems with puppies/ little dogs heads getting stuck in the gate? Yes, we did. Not a gate for small dogs. Q:What is the width of the 84″ gate when fully closed? Thank you. It’s about 20 inches. The way it’s mounted on the “fixed” side, it sort of swivels back out of the way. I’ve had it on the 58″ entry to my covered deck for several months now and it works very well. Keeps the dog from wandering away. It gets a little stiff when it gets rained on, but seems like it should last a good while. The center leg keeps it from sagging in the middle and gives it good stability. Q:Has anyone changed the latch on this gate? If so, what did you use to replace the top latch? Thank you! I haven’t had my 108-inch expandable gate long enough yet to wear out the latch, but wondered if you had thought about contacting the gate maker directly to see if they can put you in touch with who makes their latchs that they install on their gates. That is if your interested in installing a similar latch. Q:10 1/2 feet? Wondering if this gate would stretch to 10 1/2 feet and if it does, how tall is it then? Jennifer, The maximum width for this gate is 84″. The Keepsafe 108″ (9 ft.) is the widest model GMI offers. Q:do you need to make a hole in which the surface is attached – and if so, how does one make a hole with screw driver – isn’t a drill needed? Yes you do. Both the mounting side and the locking side of the gate have something screwed into a wall. If you don’t have a drill, just hammer a nail partially into the correct spot, remove the nail and use a screwdriver to screw in the screws. 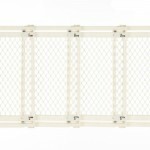 Q:What is the width of the 60″ gate when fully closed? It is 21″ when fully closed, including the latch. Q:How tall is the 84″ gate when fully expanded? I think it’s close to 3 feet tall, not sure exactly how high as far as if it’s exactly 3 feet and unfortunately I’m not home right now to measure, but I can tell you our 85lb. Golden Retriever doesn’t attempt to jump over it. The mounting brackets and the gate are designed to be, more or less, permanent. The bottom bracket is secured first, then the gate and top bracket are positioned so the top bracket can have the holes marked, then moved out of the way to drill pilot holes, and then reattached with the gate. It is quite rigid, and ours has kept our mischievous pack of dogs on the porch, where they belong, for the past two years or so, all seasons (the porch is shaded, so the sun doesn’t age the finish like it would if fully exposed). Q:How does that middle part in the gate work? Does it attach to the floor? If so, how? If not, how does it not scratch the floor? The center leg lowers as the gate expands. Also, since the gate has a bit of flex and is light, you tend to lift it as you expand it and set it on the leg. 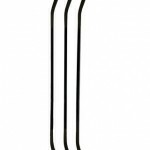 The leg has a rubber tip and supports the middle of the gate. It is a good feature. Q:Would it be possible to join 2 84″ gates together? I have a 150″ space to cover. I would attach one on either wall and stretch together. My husband and I were discussing your situation and we believe it would work as long as you have a support under each one. Just let them either meet in the middle or hook them together so they are stable. Hope this helped. Q:Would you recommend this gate to be installed at the top of stairs? The gate would be install between two walls as opposed to two decorative posts. I think it would work well at the top of the stairs. You may need to reinforce the areas on the walls where it attaches, though. Q:Will the 84″ gate stretch to fit in an 86″ opening? sorry, can’t answer that – really didn’t care for this gate overall. not very attractive and installation was a huge challenge. we never actually used it. Q:Can this gate be installed at an angle (as opposed to extending perpendicular to the wall)? I think you are asking if the gate can swing out (or in) from the mounting hardware, is that correct? If so, then yes it pivots at the brackets and can extend at an angle. I just tested mine and pulled it out to about 45 degrees and there’s no problem doing that or even further if you need to. It’s a great gate for the money and I was surprised at the quality of it! Q:when set up does it tip back and forth if say my daughter pushed on it towards the middle or does it stay up straight? It has one support leg on the bottom center of it, so depending upon how wide your doorway is, it should be pretty stable… please note though, as I stated in my earlier comment it does pinch when sliding open so if you get this gate use caution!